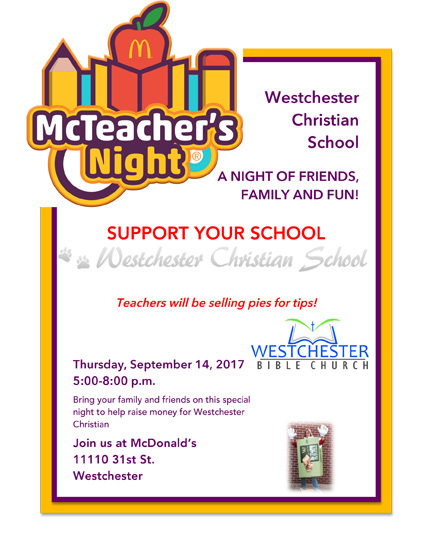 On Thursday, September 14th, from 5:00pm-8:00pm Westchester Christian School is holding their annual McTeacher’s Night at the McDonalds of Westchester. McTeacher’s Night is to help fundraise money by having teachers work at McDonald’s and giving back 20 percent of the night’s sales to Westchester Christian School. Teacher’s will be selling pies for tips! Make sure to bring your slips and turn them in to the front counter or drive thru. We can’t wait to see you all there!